The artists at William Henry Studio in McMinnville Oregon set the standard for creating the most visually stunning production knives on the planet. I had the privilege of testing out the B12 - TBPB (shown at top), a tungsten coated stainless steel spearpoint blade with an aerospace titanium frame. This knife is thin, light and tough; holding a razor sharp edge through every test I could think of. 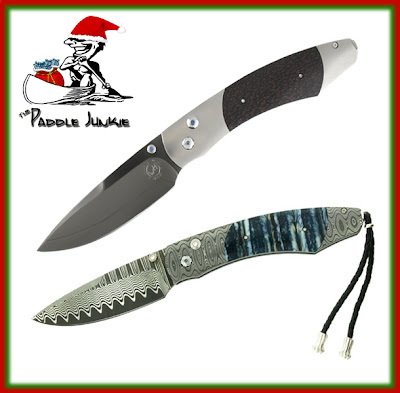 Its more decorated sibling the B12 - DMTW-S (shown at bottom) has a 'Wave' pattern damascus blade with a 'ladder' pattern damascus handle and fossilized mammoth tooth inlays. No detail is overlooked in these knives. From exotic materials to NASA level production tolerances, only the best is acceptable. Blending modern technologies with centuries old techniques and materials allows William Henry Studio to craft the finest folding knives I have ever seen. A perfect gift for the guy that has everything! MSRP: $250 to over $2000 depending on model and materials.